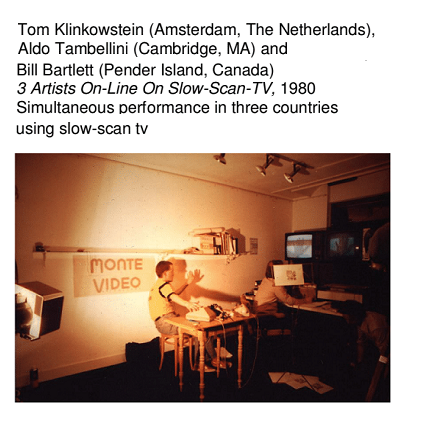 Tom Klinkowstein was already communicating with email, when he began creating Telecommunications Performance via Facsimile, a 1981 networked performance with Robert Adrian that linked the Mazzo Club in Amsterdam and the Blitz Bar in Vienna. 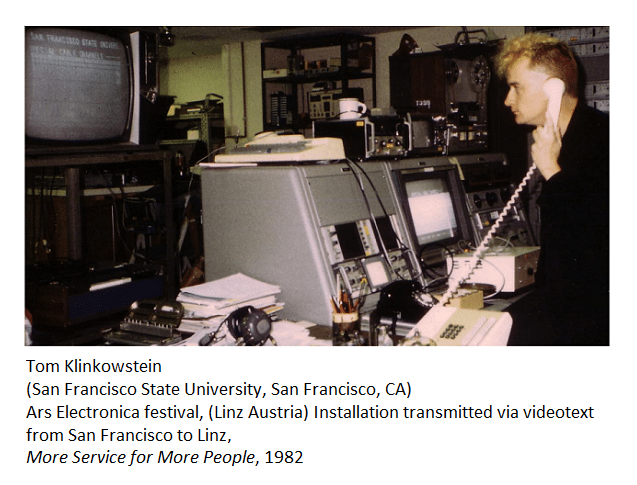 Klinkowstein's telematic projects have also included Levittown at the 't Hoogt Cultural Center in Utrecht; the Fast-Food installation, Breda, 1983 and More Service for More People, San Francisco State University and Ars Electronica, 1982. He is currently President of Media A, a design and consulting group, as well as a Full Professor with tenure at Hofstra University on Long Island, NY, and an Adjunct Professor with part-time tenure at Pratt Institute in New York City. Tom Klinkowstein's work has been shown in art centers, museums and galleries throughout the world, including the Centre Pompidou in Paris and the Venice Biennale in Venice, Italy. His work for TapIt – a free water bottle refilling network in New York City and Washington, won a Communicator award in the Green-Eco category. His 10-meter long digital artwork, A Networked Designer’s Critical Path: 1990-2090, was shown at the Fifth Avenue (New York City) Gallery of the American Institute of Graphic Design. A city-block sized version of the follow-up project in the same series about design and the future, A Day in The Life of a Networked Designer's Smart Things or A Day in A Designer's Networked Smart Things, 2030, was shown at DesignCenter Winkelhaak in Antwerp. Belgium, and at the Proteus Gowanus Gallery in Brooklyn, New York. It was also featured in Data Flow: Visualising Information in Graphic Design, published by Die Gestalten Verlag. The Museum of Modern Art in New York recently acquired a poster, designed by Klinkowstein for the artist Laurie Anderson, as a part of its permanent collection and of the Designing Modern Women exhibition. His latest work, The Universe Emerges from Information: 10-43 Seconds in the State of Awareness of an Exo-Designer, 2055, was shown this past year at Columbia University's Studio-X in Istanbul and at the Museum of the Fashion Institute of Technology in New York City. Thank you for talking with the Networked Projects in the Formative Years of the Internet project! We begin today with your role in the history of telematic art. At the same time, you were interested in telematic work, and you were in touch with Robert Adrian via I. P. Sharp's (IPSA) ARTBOX email system. An opportunity arose to perform in a new nightclub. Everything came together, and in 1981 you initiated Telecommunications Performance via Facsimile, a performance with Adrian that linked the Mazzo Club in Amsterdam and the Blitz Bar in Vienna -- using ARTBOX to plan and coordinate the event and an innovative use of FAX technology to create composite collages in eight steps, with four from Amsterdam and four from Vienna. 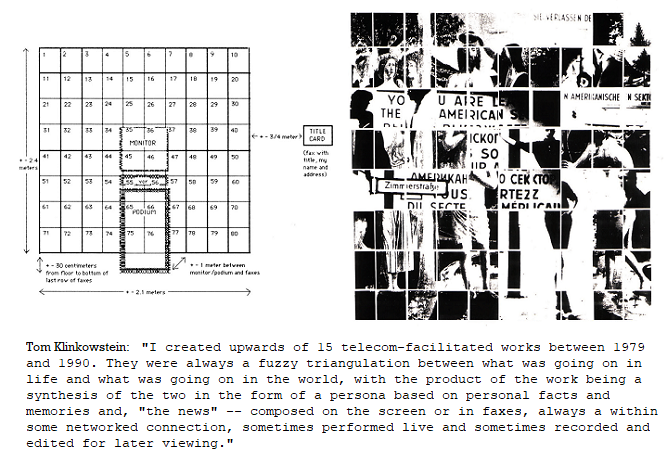 Telecommunications Performance via Facsimile was the start of a series of 15 telematic works. From my point of view, your early telematic work was somewhat different from many-node to node collaboratively augmented communications work, and it infused a creative graphic-art centered dimension into the idea of telematic connecting of wider communities. 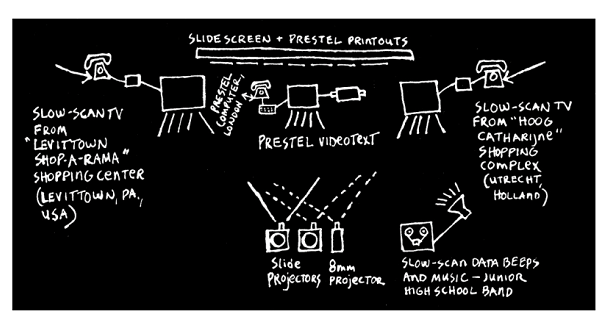 Can you talk about how you see your work in the history of telematic art? By the time I began making telematic works, I had already been a graphic designer for nine years, but I had just begun teaching a few years earlier. While I continued to design with its short term deadlines, teaching encouraged a longer view. I began to understand that unlike the products of design, the product of teaching potentially echoed far into the future in the form of my influence on the lives of my students. While I noted that others in the fledging genre of late 1970's / early 1980's telematic art had been creating works where a community was created with highly contingent content, and the point of the work seemed "merely" (it was actually very hard), to construct a networked condition, I structured my work as a course syllabus with myself as content (much as teachers usually, "teach themselves", regardless of a course's official content and purpose). I used graphic elements as the surface artifacts of the work (i.e., a McDonald’s logo), since I knew this craft and these elements were accessible, albeit "weird" when conveyed via faxes, low-resolution slow-scan tv and the like. Additionally, you took your graphic designer's background and used it to deconstruct/construct graphic design elements. And in the process, you pedagogically introduced iconic cultural/pop cultural graphic design elements into the fledgling medium of telematic art. To a certain extent, this process occurs/reoccurs in your work. So, this seems like a good time to talk a little more about the works that followed Telecommunications Performance via Facsimile. Your work and home-base have spanned the Netherlands, the San Francisco Bay Area, New York City, and Paris, among others. In addition to the works discussed in your paper -- Levittown at the 't Hoogt Cultural Center in Utrecht; the Fast-Food installation, Breda, 1983 -- what are other works you were involved in that you consider particularly important? And did the locale from which each work originated play a role in the shaping and performance of each work? In the late 70's and early 80's, establishing the network (the capabilities for a performance using telecommunications for instance) was daunting. It was a labor of love requiring quasi-missionary zeal. Although McLuhan had coined the term, "global village" a decade and a half earlier, creating a network connection where none had already been constructed for practical and/or commercial purposes and within an artist's budget, was not to be lightly undertaken. -I needed to convince the management of the Mazzo nightclub in Amsterdam that a performance with fax machines was technically viable (telecom installations in those times were a highly technical and state regulated activity, and often did not work without major tweaking). -I needed to convince Mazzo that a fax-performance was the right sort of "entertainment" for a late night, “new wave” audience. -I needed to find a partner to be on the other side (eventually Bob Adrian in Vienna). -Once found, I needed to coordinate with Bob. (Phone calls were wildly expensive in Europe across national boundaries in those days. We supplemented calls with the primitive, email-like ARTEX network on the IP Sharp system (itself an ordeal, billed per character and using an "acoustic modem coupler" and a Texas Instruments portable computer terminal). -I needed to procure sponsorship from the Dutch state telecom authority for the (for then) pricey "telecopier" (fax) hardware (4000+ Dutch Guilders or about $2000 in 1981-era funds), and the additional telecom lines to be used during the performance, all to be installed in an all-black-painted nightclub known for its questionable late night activities. "In addition to the works discussed in your paper -- Levittown at the 't Hoogt Cultural Center in Utrecht; the Fast-Food installation, Breda, 1983 -- what are other works you were involved in that you consider particularly important?" "And did the locale from which each work originated play a role in the shaping and performance of each work?" I created upwards of 15 telecom-facilitated works between 1979 and 1990. They were always a fuzzy triangulation between what was going on in my life and what was going on in the world, with the product of the work being a synthesis of the two in the form of a persona based on personal facts and memories and, "the news" -- composed on the screen or in faxes, always a within some networked connection, sometimes performed live and sometimes recorded and edited for later viewing. I moved back to the United States in 1986, after nearly 10 years in Europe. The work I did after that reflected my adjustment to being back in the U.S.A. and the questions I had. Go at Throttle Up was begun in 1986 and finished in 1987. I was interested in my relationship to women and what I might learn from re-connecting with as many former girlfriends as possible via recorded phone calls, and what it might lead to for my new future in New York. In the middle of the process of creating this work (unnamed at that point), the space shuttle Challenger exploded shortly after launch. As a "creative adjacency", I decided to include video from the launch, the explosion and audio of the flight controller in the new work. This was in no way meant to be morbid. As I edited the recorded phone conversations with former girlfriends from the previous 15 years, it was as if they were there together in the audio studio at the New School in New York City where I was teaching at the time. Including the Challenger material (a high quality first generation dupe purchased from the American broadcast TV network, NBC) was an affirmation of risk-taking. The bravado of defying gravity that space flight required and the attendant risks, all made perfect sense in a piece about intimacy and love. By 1990, the notion of network had moved from the periphery and the concern of experimentalists and artists to the center of professional life, as fax and email were common and the Web had just been invented. -A former girlfriend told me during a phone conversation (recorded as part of the raw material for Go At Throttle Up in 1987), that when she thought off me, she pictured a figure in the back of the fresco, The Baptism of Christ from Piero della Francesca. I went on to greatly enlarge The Baptism of Christ fresco and the image of myself in front of the Berlin Wall. I then cropped and segmented each into 40 unique A4 prints. Finally, I arranged the A4 prints into a composition 2.4 meters high by 2.1 meters wide, composed of 80 elements. 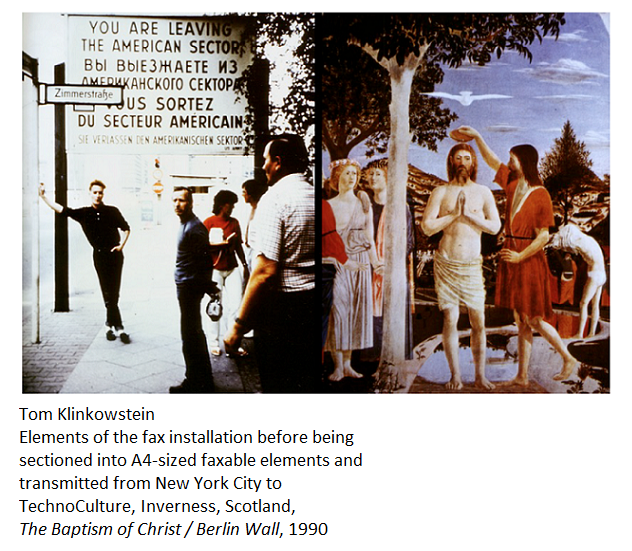 I recreated this work for a show on fax art at the Drawing Center in 2009 and that same show wrote, with artist Carla Gannis, "Temporal Tunneling Fax, 4/17/2030 > 4/17/2009”, inspired by The Baptism of Christ / Berlin Wall. "...This reminds me of Plato's dialogue "The Symposium", in which Aristophanes describes the beginnings of the two genders. He suggests that human beings were originally big blob-like entities with double sets of everything. Zeus split them apart for being too full of themselves. Since that time, we have been trying to put ourselves back together again. That searching for the original other half may be futile, but the trip itself is very important. The quest for unity, the urge to reunite what is split apart is an artful-designerly impulse. It restores things to their proper balanced aesthetic. It is trying to create a thing of beauty. That was the aim of fax and media artists, researchers, designers and professors of new media of the late 20th and early 21st centuries, with their writings, conferences, projects, and experiments. They were attempting to bridge the divided realms of the virtual and the physical and make beauty." Your use of the personal against a backdrop of iconic public events is clearly documented in the works you describe here. There were examples of this strategy in networked projects, for instance, a domestically-situated melting iron on an ironing board is juxtaposed with images of the Falklands War in an image sent from the Australian node of Robert Adrian's The World in 24 hours (1982). But, to my way of thinking, this strategy was more prevalent in performance art, where the physical insertion of self into public situation, in work such as Eleanor Antin's invented selves in various public situations, or Chris Burden nailed in self-crucification to a Volkswagen (Trans-Fixed), or Suzanne Lacy's Travels with Mona, which recast the Renaissance art tradition of including contemporary personalities in paintings. A more recent example is Renee Cox's performative photograph Yo Mama's Last Supper. Challenging American colonialism while at the same time exploring your roots, beginning in the 1980's you have used your early life in Levittown -- and contingently American culture as seen in a global context -- as material in the making of telematic art. Today on contemporary social media, in art contexts, the expansion of selfies with concepts of community and culture has enriched the infosphere. I'm thinking of Man Bartlett's Twitter-based #24hOpen in which he attempted to spend 24 hours in Best Buy, Union Square, without buying anything or Sandra Cisneros' Instagram page that, with images and words, explores her life in terms of Latina community and culture. Can you tell us a little more about growing up in Levittown, how that culture was important in your work? And do you consider your work in the context of performance art? "Can you tell us a little more about growing up in Levittown, how that culture was important in your work?" It was all about change and newness, rubbing up against the values of my parent’s generation, mostly WWII veterans leaving cities like Trenton, NJ and Philadelphia PA.
My family moved to Levittown in the early 1950’s as it was being built. It was a kind of reverse assembly line with crews clearing the land, then laying the foundation, another putting up the walls, etc. As we moved into our recently completed home, this process was happening nearby. In primary school, I went to four different schools, as the districts were re-zoned to accommodate the growing population. My father sold TV’s at the then new, "Levittown Shoparama", where Santa Claus arrived by helicopter and landed on the roof of my father's department store. I saw John Kennedy campaign for the presidency in 1960 near that same location. One of my earliest memories of political awareness was overhearing late night discussions between my parents and relatives talking in a troubled tone about the first African-American family moving into our neighborhood and then about that same time, a similarly toned discussion about a family from the Soviet Union arriving. I was regularly slurred with anti-Semitic slogans by kids in my primary grades who thought I was Jewish (I wasn’t). Recently while doing some research for a new (as yet undefined) work, I read numerous interviews with the visual futurist Syd Mead (Star Trek, Bladerunner and Tron, etc. ), and realized I had seen his Gyron concept vehicle work for Ford in 1961 at an auto-show. At that same time, I had my picture taken with the then Miss America. The sensation of being in the presence of the sleek, expansively optimistic Gyron, and the sexual excitement of standing next to Miss America are likely the roots of my transposing global events, technology and intimacies. "And do you consider your work in the context of performance art?" My connection with performance art is one of coincidence rather than being of that genre. After undergraduate school, I worked for Priority One and Model Cities in Syracuse, both were efforts to use contemporary media approaches to address urban issues of poverty, infrastructure and employment opportunity of the 1970’s. In that context, I approached the local modern art museum, the Everson Museum of Art in Syracuse about a retrospective of the work with Model Cities. This show took place in 1975 and with the attendant preparations, I became familiar with the work of Nam Jun Paik, Yoko Ono, Charlotte Moorman, and others who were exhibiting and performing at the Everson before, during, and after the time of my show. In the early 1970's, I befriended and briefly worked with Bill Viola (we were both graduate students at Syracuse University experimenting with small format video). Bill was in his early stages as an artist, and through proximity, I at least became comfortable with the vocabulary of performance and installation art, if not actually feeling I was one. My performances a few years later after leaving for Holland, were inspired at least as much by the selling floor of the TV department at Pomeroy's Department Store at the Shoparama, as they were by Nam June Paik's multiple video monitor installations and Bill Viola's dedication to early video art. "My performances a few years later after leaving for Holland, were inspired at least as much by the selling floor of the TV department at Pomeroy's Department Store at the Shoparama, as they were by Nam June Paik's multiple video monitor installations and Bill Viola's dedication to early video art." Fascinating! The TV department at Pomeroy's in Levittown's Shoparama; Nam June Paik's iconic many-monitor installations; your connection with Bill Viola. Some art works stay in one's mind forever. I'm thinking of walking through the redwood trees Viola installed inside the Capp Street Project and encountering in this "sanctuary" the video of a woman giving birth. I'm less familiar with his videos that looked at Renaissance panel painting in conjunction with video frames, but the connection with your imagery is potent. And it is important to be reminded of the racism in Levittown. I just finished reading Hidden Figures The American Dream and the Untold Story of the Black Women Mathematicians Who Helped Win the Space Race, and then watched the movie; wanted to see what working at Langley was like. (I learned to program working for the company that made the Orbiting Solar Observatory). The pervasive presence of segregation in conjunction with the extraordinary work of the women "computers"; the contrast between their work and the segregated environment in Virginia. Unforgettable. Great to hear that you worked with Model Cities program in Syracuse! The next question, then, is what were reactions to your conveying Levittown culture in a global context? "The next question, then, is what were reactions to your conveying Levittown culture in a global context?" These performances were happening in the wake (5-10 years later) of American military involvement in Vietnam. When I started teaching at AKV St. Joost in 1977 (Art and Design Academy St. Joost in Breda, Holland), one of my older faculty colleagues was calling Americans, "the new Nazi's". There were a lot of mixed messages regarding America in the air in Holland and Western Europe then. I was hired to bring a new sensibility to the design program because of my trans-disciplinary comfort and my ease with technology and general agreement with McLuhan that technology was an extension of who we are rather than unnatural or alien. But I was also handled cautiously and treated with a combination of curiosity, distrust and admiration. 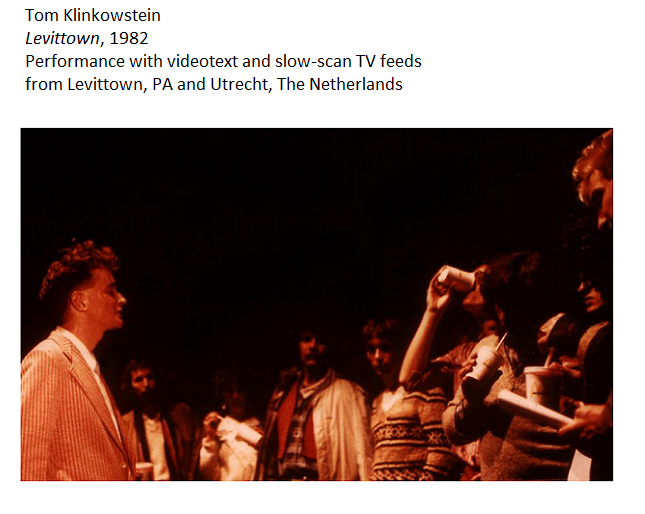 I recall at my performance, Levittown in 1982 at 't Hoogt Cultural Center in Utrecht, Holland, where I had slow-scan TV feeds from Levittown and a local Utrecht shopping center, that one of the questions was, whether I felt responsible for the development of the Neutron Bomb (a new for then atomic weapon that killed but left property intact). This, all the while, while the audience sipped McDonald's milkshakes which I gave out at the end of the performance. The complexity (intellectually, politically and sensorially) of that moment was exactly the experience I was trying foster. What I now call (thank you Rebecca Solnit), "telling a more complicated and accurate story". Well yeah, the Vietnam War was mostly over in 1975, but the afterimage lingered. In Northern California, an iconic work of protest art was Terry Fox's 1970 performance when he napalmed rare plants outside the Berkeley Art Museum; people are still angry about this from one point of view or another, but I notice that contemporary art history coverage of this performance does not always mention the Vietnam War context. So, the time period you are talking about is later, but the lingering hostility towards America persisted in European art circles, and Europeans are still concerned about pervasive American Internet culture, with good reason. But one thing that is important about your work is that you centrally raised these issues. My recollection is that they were present in International collaborative networked events, but it was an undercurrent. Now, we are often working in social media platforms that provide enormous opportunity for content of all kinds and are free and relatively easy to use compared to early social media, but there is a concern that they potentially homogenize and control content. Do you see contemporary social media platforms as what Jim Brown would call "hospitable"? And do you have any thoughts about how artists could work more extensively in the creation of social media-based content? "Now, we are often working in social media platforms that provide enormous opportunity for content of all kinds and are free and relatively easy to use compared to early social media, but there is a concern that they potentially homogenize and control content. Do you see contemporary social media platforms as what Jim Brown would call 'hospitable' ?" Certainly, the near ubiquity of social media and connectivity in a large portion of the planet's population does not signal a moment that Heaven has arrived on Earth. As these networks have moved from being expensive, unreliable and downright clunky to a condition that has enabled, enhanced, accelerated or extended the change of scale, pace and pattern of human affairs, they have become a part of nature. When my daughter Gemma was 10, and her beloved pet hamster, Pom Pom, was ill, she awoke one morning before school to find Pom Pom near death. It was early on a school day and she usually took 15 minutes over warm chocolate milk to wake up. But that morning, she went right to the hamster cage, began to cry, comforted Pom Pom by cradling him in one hand, and then just as instinctively, documented herself, the ailing Pom Pom, and the entire scene with her iPhone, posting the unfolding encounter of her first brush with mortality to Instagram before I even noticed. She progressed through the grieving process onto healing within minutes, drank her chocolate milk, got dressed, finished her homework and went happily off to school. "And do you have any thoughts about how artists could work more extensively in the creation of social media-based content?" -Sculptor Richard Serra's action verbs: moddulate, distill, reform, etc. My Master’s student at Pratt Institute in New York, Zoe Meeks, employed similar strategies with high school social media communities in Brooklyn’s Bed-Stuy neighborhood, uncovering and participating in FB mash-ups (which became "business cards"), employing / subverting corporate boosterism and activist references for the purpose of persona-building / world-building. Thanks for documenting your work for Networked Projects in the Formative Years of the Internet! 2. Hank Bull, "DictatiOn, A Canadian Perspective on the History of Telematic Art," in Judy Malloy, ed., Social Media Archeology and Poetics, Cambridge, MA: MIT Press, p. 127-138,132. 3. Klinkowstein, 1986, pp 108-109.